Hackers have put in a great deal of work to break down systems by whatever method available and they exploit even the smallest opportunities they get. While IT systems are generally concerned with security issues, it’s worth stating that mobile phones require the very best security ever. This is because virtually everyone across the globe uses a mobile device. This exposes us to the many threats posed by any security leakage either emanating from development errors or negligence on the part of users. Manufacturers keep researching new and better ways of tightening security and keeping users’ data safe. However, individual users of mobile devices must complement these efforts by keeping their devices safe too. Well, this exactly what this post is meant. I will give 11 ways of keeping your devices safe. So, before we look into these tips, let’s first discuss the dangers of ignoring security tips and ways of attack. This is not a guarantee that doing all or any of these tips will provide 100% security proof to your device. Instead, it increases the security of your device and decreases the chances of you being hit. Hacking is not a new term and has been on the ascendancy as people keep falling victims of malicious attempts and activities from hackers. Hacking generally has to do with gaining access to someone else’s data, device or information without permission. Most hackers use several methods such as brute force attack, spyware, etc. to invade others’ privacy. This allows them to access confidential information which they use to carry out their odious intents. Failing to adhere to security protocols and guide can expose all your confidential information an attacker. With the mobile world comes portability and productivity. You can easily perform a number of tasks on your mobile device while on the move. This is possible because of the available features and apps. As a result, users tend to store relevant and frequently needed information on their mobile devices of easy access. Such information can be official documents, financial transactions, proposals, technical documents, among others. Having such sensitive and relevant documents on your device poses a security concern. For instance, an attacker can hijack such documents or completely delete them from your device resulting in a loss. Similarly, sensitive information such as credit card pins, access codes among others can be stolen and used against your desire. There are instances when people have reportedly stated that they can’t access their phones any longer. Some of these attacks are completely aimed at damaging your precious device without remedy. Damages to your device without alternative storage and probably backup leaves you at the mercy of the attacker. Aside from that, poorly developed apps can be of great damage to your device if the appropriate security measures are not put in place. Though most of such apps are usually from uncertified apps store, it’s is advisable to stick with is safe and secured. There are a number of malicious attacks everyone smartphone user shouldn’t fall victim of. Avoiding these attacks begins with you understanding how some of these attacks are carried out. I have grouped most of these attacks for better understand. Viruses have been used to infiltrate devices and perpetrate evil. However, these attacks occur when these viruses are launched by the user or an app that has been permitted to do so. Whether it’s by brute force attack or by decrypting of security forms (password, PIN or pattern), physical access is a common way by which people gain access to your device. For instance, using a weak password allows someone to try out a few combinations with the hope of unlocking your device. Also, weak patterns can be traced and easily captured by someone attempting to access your Android device. 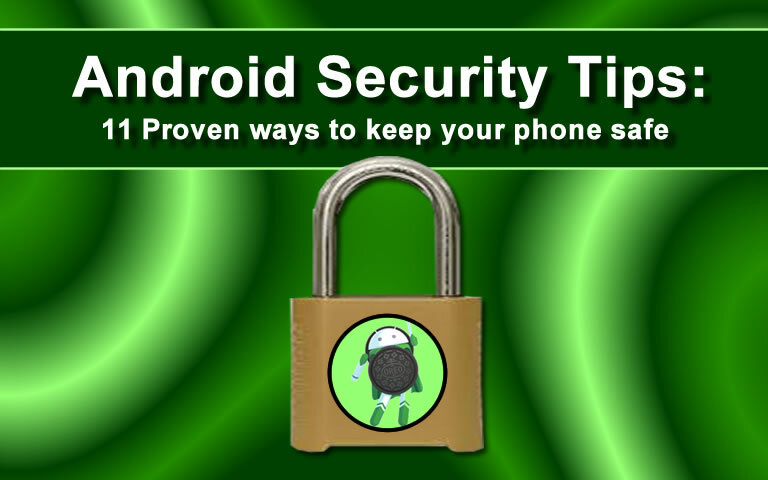 Now, you have basic knowledge of security concerns and why it’s necessary to secure your device using these Android security tips. Therefore, let’s see how you secure your device(s) using these tips below. First, let’s begin with protecting physical and unauthorised access to your device. The first step to ensuring this is by activating the lock screen feature. Aside from improving the performance of your phone’s battery, this feature can boost security. Personal Identification Number – that will be entered when the screen is turned on. This ensures that only those that have access to your phone. Use Pattern to improve security when the screen of your device locks. Whilst PIN allows you to enter set numbers sometimes 4 numbers, Pattern allows you to draw shapes on the screen that will be used as the security access key. While weak patterns can be easily repeated by others, highly complex patterns are difficult to repeat. Turn off Make pattern visible. Also, activate Require pattern to start device. These two features combine to strengthen the security of your device and limit or prevent access to your device. Before you become confused with the difference between a password and PIN security, let me immediately explain. Most phones allow you to choose the type of screen lock protection to use. A PIN is usually made of numbers alone, most times 4 numbers while some other phones allow up to 5 numbers. A Password, on the other hand, allows alphanumeric characters. That is a combination of numbers, alphabets and symbols, or any one of these. Whilst you can make passwords visible during entry, note that this can expose everything and defeat the purpose of using a security method on your phone. Therefore, ensure that passwords are not made visible. Combining characters allows you to come up with a very strong pass string that is not vulnerable to guesses by an attacker or hacker. Avoid the temptation of using your name, nickname or something simple that is akin to you as a password. It will only expose you to security breaches. The above is not explicit. You can add other features that will further strengthen the security of your Android device. This feature allows you to set up a fingerprint account that extends the security of your device. The use of fingerprint restricts access to you alone as your fingerprints are unique. For any other person to access your phone, you have to unlock your phone with a fingerprint. However, your device must support fingerprint scanning without which you cannot use this feature. There are several mobile phones that now support fingerprints. There cost-effective smartphones with fingerprint feature you can easily purchase to use this security feature on your device. This is yet another innovation in mobile technology. The Face ID supported phones utilise recognition algorithms to help smartphones scan one’s face and determine matching results. Having a Face ID account on your phone will easily allow you to lock and unlock your phone with the scanner. Sometimes, you might grant access to your friends, colleagues or family members but do not want them to have access to your confidential information. In such a situation, you can hide this confidential information and files to keep them away. Having such security protocol in place will guarantee (to a particular percentage) that people close to you do not view or use your private files or information. 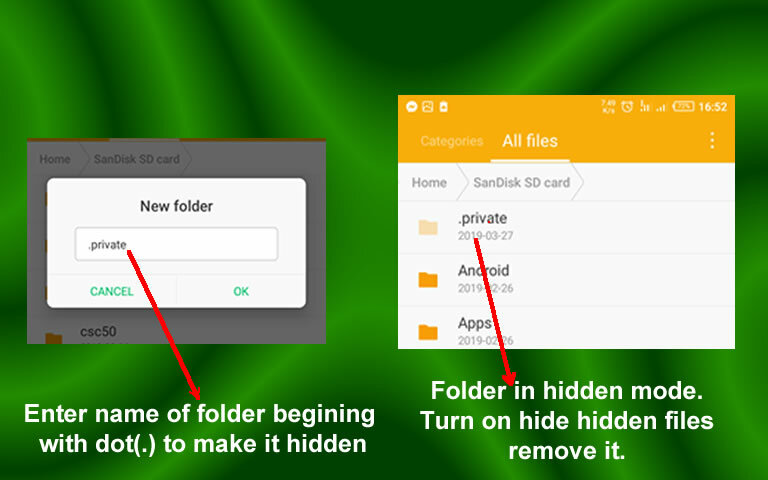 There are quite a number of ways of hiding files on Android devices. However, I prefer the use of an app. One of such apps is the Infinix Xhide app that assists you to hide videos, pictures, music, apps, among other important files. I have a complete guide and tutorial on how to use the Xhide app here. Aside from the Xhide app, you can download and install apps that allow you to hide files on your device. The second method of hiding files is less secured but let me show how to go about it. Launch a file manager and navigate to the directory where you want to store the private files – be it micro SD Card or Internal storage. The dot symbol at the beginning of the folder’s name gives it the hidden attribute. By default, your phone is configured not to show hidden files. So, you may not see this folder after creating it. Move on and enable show hidden files. This will reveal all the hidden files and folders in that directory. Open the folder you just created and transfer your files there. Then change the settings back to Do not show hidden files. This security method is cheap and less secure because anyone can turn on the features on the phone or laptop to access all your hidden folders. Therefore, using an app to hide your private files is best. 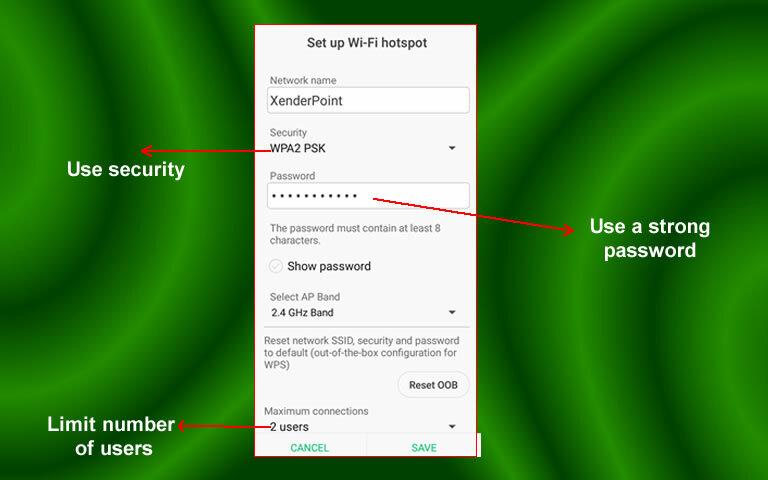 Sometimes you use Xender to share files with your colleagues or simply turn on your Hotspot to share internet connection with your friends. Surprisingly, most people do this without protecting these connections. An Open Wi-Fi exposes the network to attack. A few persons I have been privileged to talk to about how they leave their connections open often reply that, “the internet is off”. The truth is, whether the internet is on or not, once you establish a connection without protection, you have opened the door for an attack. It could be a virus, worm or spyware that might be activated on your device or on everyone connected to the network depending on their security settings. 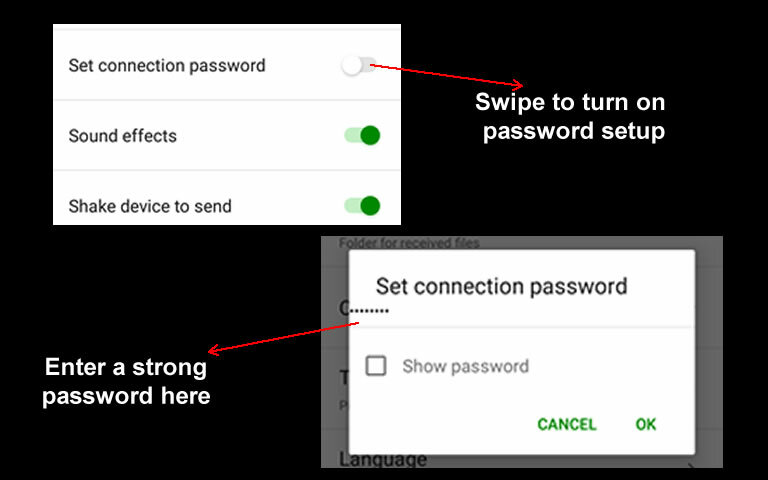 Setup a strong connection password which only you should enter into the device(s) connecting to it. Change your connection password each time after sharing with someone. Limit the number of devices that can connect to it to just two except when there is a need to increase the same [This feature is not available on some phones]. For Xender, follow these steps to set up a password. Note that anyone intending to connect will enter this password which is different from your Hotspot password. By that, you’re protecting and limiting the connections to your phone to those you have authorised. Launch Xender and tap the menu button (a panda icon) at the top left corner. Turn on Set connection password and enter a password that is exactly 8 characters. Then tap OK. Setting up your Xender this way ensures that only those you give passwords can connect. So, even if you share data it will only be with those set of people alone. This is a security feature on your phone that when ignored can allow malicious applications to be installed on your device thus gaining access to your files. If you’ve once installed an app outside the built-in store of your device, you probably would have had to turn on this feature before installing the app. Simply put, this feature prevents the installation of apps from sources that your device deems unknown. Some of such sources include the internet, apps transferred from another device to your phone, and those from another store. This feature is disabled by default. However, check the settings of your phone and ensure that it is disabled. In case you find out that the feature is enabled, simply disable it. Recent Android OS allow you to decide which feature and data an installed app can access on your device. You can control access to data such as contact, images, videos, location, internet, messages, among others. Let’s assume you don’t want WhatsApp to access your contact list, you can easily prevent access. However, some of the apps will require permission to access some of this information before they can work. 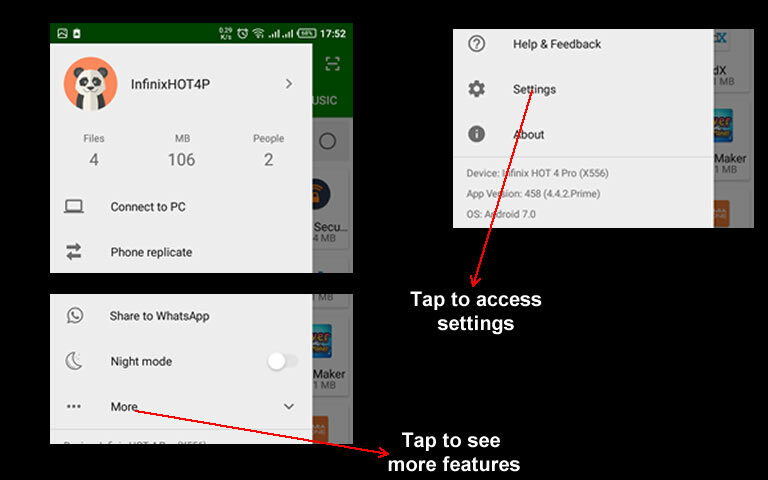 The example above will stop WhatsApp from functioning on your device. In managing permissions, you will need to decide the apps you need and trust before allowing access. There are several malicious apps out there you should be mindful of to stay safe from invasion. Basically, most system apps will have access to information on your phone but you can still decide to limit such access to some information. For instance, Google Maps will need permission to display your location if you choose to grant. While installing an app on your device, you will often have to grant permissions required or requested by the app. At this point, you can decide what permissions to give to the app. Depending on what you want, you can give all the permissions or a few. What happens if you’ve granted some permissions to the app already then decide to withdraw the permission? All you need to do is to remove the permissions. For supported OS, go to Settings, then Permissions to access all the accessibility features you need to control access to information on your device. Sometimes, you can’t avoid the temptation of downloading apps from a website or another store. For instance, a game you find to be interesting but not on Google Play Store can be downloaded from the offering website. However, this should be the very last option available to get the app. In such a situation, ensure that the app is fully scanned to ensure that it’s not malicious. An antivirus app such as Avast has the feature to automatically scan an app before installation. I personally find this app to be useful in protecting my Android devices against attacks, aside from scanning apps before download. Some devices come with built-in security to scan apps before download. Endeavour to use this feature in order to stay safe while downloading and installing apps from sources outside the built-in store, in this case, Google Play store. Launch your app and tap the menu button at the top left of the app. This will reveal commands, scroll down and tap Settings. Next, tap Protection to access the protection features offered by Avast. Then, turn on the App Install Shield. 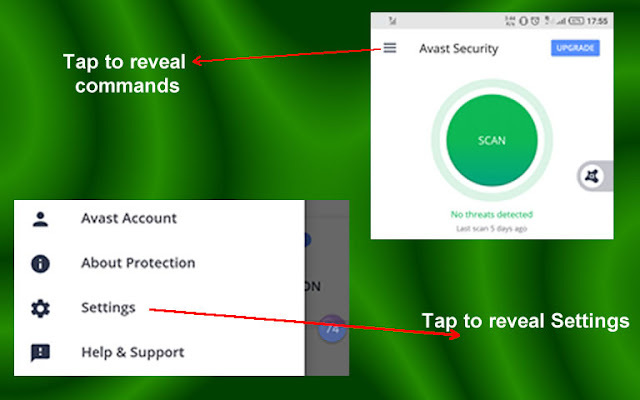 Once this feature is activated, Avast will prompt you for a scan when you intend to install an app from an unknown source. Never install apps from Unknown Sources irrespective of the security measures you have put in place. The chances of installing a malicious app are usually high from sources. Often you will hear people emphasis on this as one of the Android security tips you must adhere to keep your device protected from hackers. There are a number of malicious apps on the internet. Some of them offer cool features at a cheap or zero rate as a bait to make you download and install on your device. Theft of security details including passwords to online accounts, credit cards, tokens among other details. The hijacking of the functioning and performance of your device. An attacker can turn on or turn off your phone anytime he desires. Similarly, your device can completely be damaged. Theft of cellular data, credits among other things. Therefore, avoid the temptation of downloading apps from unknown sources and stick to the stores in your device. Google Play Store is a robust and secure app store from where you can download (or purchase) and install whatever apps you want. Features such as Play Protect ensures that apps are scanned and certified to be safe for users to install. This mobile security tip becomes useful in the event when your phone is lost or stolen. From Android 4.2.2, users can now set up and manage their devices remotely. 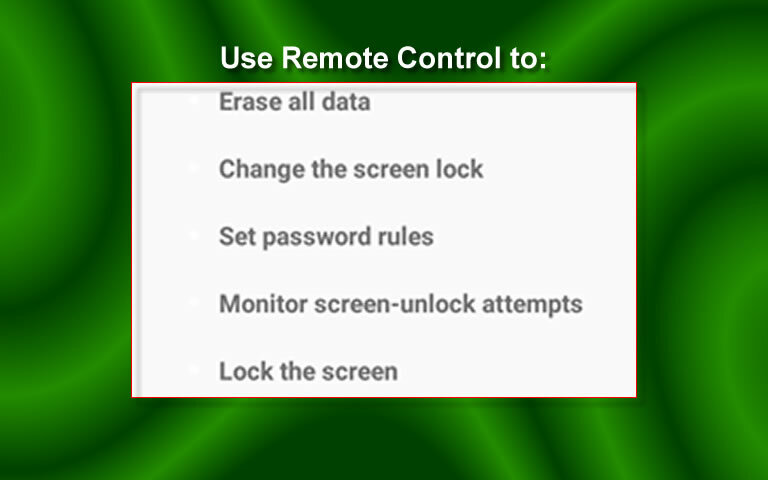 This feature allows you to clean wipe or reset your device from a remote location. Such ability can be useful to protect your data and information from hackers in the event of a lost device. It equally works nicely with Google Play Services. However, you must first activate this feature on your device. Access the settings on your phone, then tap Device Administrators. By default, this feature should be activated. Otherwise, activate it. Alternatively, use a third-party app like Avast Mobile Security or Avast Anti-Theft app to activate this feature. For devices lacking this feature, using a third-party app will be the best solution. However, you will need to create a free Avast account to utilise these features when the need arises. As frequent as required and as much as possible, update the apps on your device to keep up with the latest fixes. There are a lot of reasons why developers update their apps. One of the reasons is to fix security caveats discovered. From mild to severe loopholes, attackers exploit every available opportunity to sift malware into networks and devices from where they carry out their evil intentions. To combat this, developers immediately fix security vulnerabilities on their apps and present same as updated versions on their respective apps’ stores. Keeping this in mind should prompt you to always update the apps on your device, most especially updates to the OS. Never undermine these so-called small updates because you can be exposed to attacks for failing to keep up to the expected security features and updates. Google Play Store integrates the feature to auto-update your apps from the store. All you need is to turn this feature on and ensure there is an internet connection on your phone. Whilst this isn’t healthy on the amount of cellular data used, it’s worth staying safe than being hacked. Alternatively, if you fancy the hassle of manually updating your apps to manage cellular, then give it a short. Just like you update WhatsApp and your other social media apps to access new features, do same to the other apps to eradicate security doubts. If this is your first time of hearing 2-step or 2-factor verification, let me briefly explain. The system (server, app or online service) sends an OTP and asks for you to enter the OTP sent via SMS or email to the details you provided. You enter the OTP provided and then access your account. With 2-step verification, an attacker will need two sets of details to access your account. First the login details, then OTP which will be sent to your registered SIM or email address. Should an attacker succeed with the login details, accessing the OTP becomes difficult. The OTP expires within 10 – 20 minutes depending on what has been set by default. 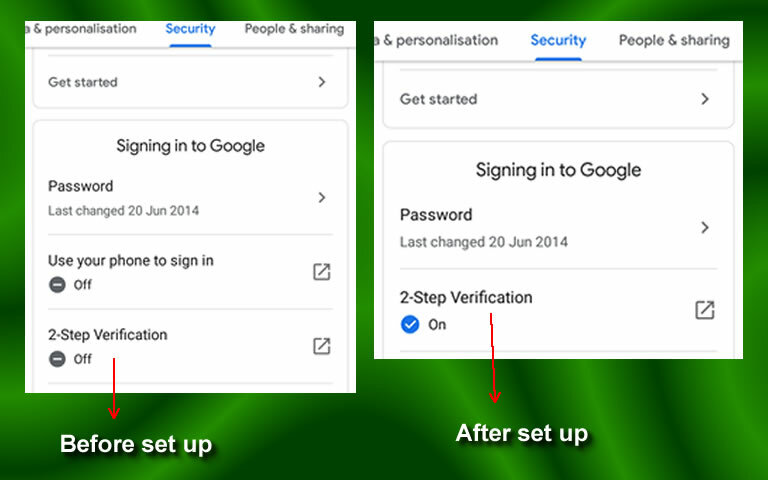 So, you can secure your Android device by activating the 2-step verification on your Google account. 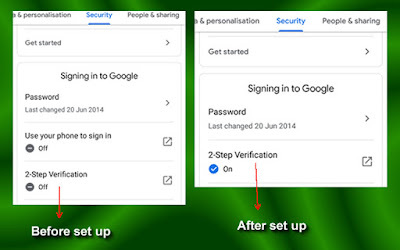 To use 2-steps verification on your Google account, simply access the Google Account app on your phone or go to Settings>Google. For some other phones, you will need to follow this path Settings>Accounts>Google. Alternatively, launch the app by tapping on it from your Apps’ list. You will need an internet connection to access details and set up the verification. Once you’ve launched Google Account, tap Security, scroll down and tap 2-Step Verification. By default, this feature is turned off. Now follow the steps and instructions to activate this feature. Don't forget to Use another backup option. This will enable you to sign in even if you've lost your phone or SIM. Most useful if you use your SIM for the verification process. Encrypting device data renders your data – emails, contacts, messages, etc – in unreadable formats making it difficult for attackers to decode. With such encryption, there is a guarantee that your phone’s data is safe. Modern phones, especially those from Google – such as the Pixels series – come with the Encryption already activated, while a few others require you to manually activate this feature. Your phone can become very slow in operation as the process of encrypting and decrypting decreases performance. Your phone’s battery should be fully charged – at least 80% - before you begin. Once your phone is encrypted, the only way to undo it is to restore factory settings just like starting from the beginning. To encrypt device, access Settings, then Security. Next, tap Encrypt device data or Encrypt phone, follow the instructions to complete the encryption. It’s advisable to have your phone connected to a power source while encrypting. Security is essential in this internet age and no one is advised to take chances. These Android security tips are essential and important in protecting your device and information against the very many attacks from hackers. Most importantly, with the world going mobile, it becomes difficult to separate your devices from the information and data you use regularly. That means they will be stored in your device which must be kept safe and away from the prying attempts of attackers. Finally, don’t forget to help others keep their Android devices safe too.